Tasking is not fun if the task assigned is no fun. He likes to play MineCraft, and builds stuff on his tablet and home computer. This is like building in MineCraft but specifically designed to teach math. When they are in first grade math should be fun and easy. It should also be conceptually based. Symbols can wait. The same way we don't make very young children write English as they learn English there is no need to introduce symbols right away and in public schools they emphasize writing math way too early in my opinion. They nead to hear the language and get fundamental concepts that they can see and get their hands on, symbols tend to muddy the waters and take away from clarity at this age and they really slow things down. Later when they see the symbols that stand for the numbers and operations they've heard it makes sense. These videos show how to do it. Remember at this stage of the game all he is doing is counting and I am teaching him to discover how to count for himself...and how to say what he has done. We are basically figuring out how to count more quickly and easily. The brain WANTS to work fast but at this age it lacks training. But rather than drill facts I am showing him ways to count quickly. We also drop the algebra in right away. Listen for the discoveries. Little kids like math. It's fun for them except when you make their hands hurt from so much writing. 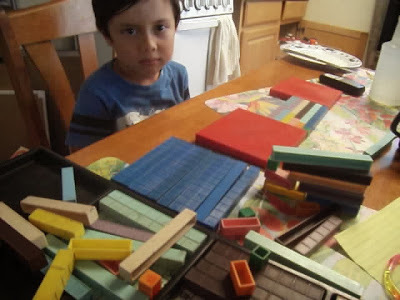 You can see for yourself all the math facts he is getting consciously and subconsciously (and that is where the bulk of the learning takes place). Don't get me wrong I have first grade worksheets, but you want to use them sparingly. Look for more work with this kid on the Password protected pages and future blog posts here. Meantime join me on FB.